The mustard is thick these days. I’m not talking about the tasty yellow stuff that goes on your hot dog, but the wild mustard that grows in the Heartland. In the springtime it is everywhere. Here at Tell Dan it is almost as tall as a person. The wild mustard (Sinapis arvensis)* is prolific this year due to a wet winter in the region. It stands tall now but in short time as the temperatures rise and the rainfall diminishes, it will turn brown and brittle. Enjoy this day my friends. It is gorgeous. Photograph by Bible Land Explorer Jessica Poettker. *Luke 13:18-19 reports the parable of the mustard seed. It suggests that big things come from small packages. The scientific name for the mustard sinapis is pulled into Latin from the Greek σίναπι. However, it should be noted that the Greek family of words also includes the verb, “to sting” or “hurt” causing some to believe that the sinapis of the New Testament may refer to the nettle. That casts a different angle on the text doesn’t it? The residency program of Johnson University leads to a Master of Strategic Ministry degree. It involves a collaborative relationship between Johnson University and local churches. This accredited program equips students for effective, strategic Christian leadership and includes a study-tour to Israel/Palestine. To learn more about residencies, see the link here. Standing on the summit of Mt Carmel I watch the rain sweep through the region. It pushes in from the Mediterranean and moves east, washing the central hills. I shiver in the wind. It is the perfect moment to reflect upon the story told in 1 Kings 18. There, we read of the contest between the prophet Elijah and the prophets of Baal. The story has many points of entry but one of significance is the question: who controls the rain? Is is Baʿal, Rider of the Clouds or YHWH Adonai, the Creator of all things? Find a dry place and consider the story for yourself (find it here). Don’t miss the big finish. It is initiated by a cloud the size of a man’s hand and spotted from Carmel’s furrowed brow. “Meanwhile, the sky grew black with clouds, the wind rose, a heavy rain started falling and Ahab rode off to Jezreel. The power of YHWH came on Elijah and, tucking his cloak into his belt, he ran ahead of Ahab all the way to Jezreel (1 Kings 18:45-46). It was the first mud run. Photograph by Bible Land Explorer Seth Tinkler. If you’d like to “read the fifth,” be aware that there are openings for Israel/Palestine trips departing this summer. Shoot me a note at markziese@gmail.com or see our full list of study-travel opportunities here. "If not for this site, you wouldn't be here." I utter these words every time we settle into this Roman theater. The phrase is awkward by itself. But if you put in context, it makes perfect sense. The theater is located at a site known as Caesarea-by-the-Sea. It was a wind-swept rubble pile when archaeologists began restoration efforts in the 1950s. Today the place has been wonderfully restored and is visited by millions every year. One can sit on the sandstone seats of the theater and gaze toward the Mediterranean. It is the perfect spot to imagine how astounding this city must have been in its prime. According to Josephus, this provincial capital was built by Herod the Great (“the baby-killer” of the Christmas story) in the decade between 22 and 12 BC. It has all the accruements of a first-century Italian transplant. According to Luke the Evangelist it was here that a Roman centurion by the name of Cornelius had a vision (see Acts 10). This revelation prompted “Pentecost II,” the spark that leaped over the fireline and out of the Jewish circle. Christianity moved with speed and force from “Caesar-city” into the non-Jewish world. That’s why I say it. If not for Caesarea-by-the-sea and the events associated with this place, I doubt that Gentiles like you and me would be sitting here. But because it did, the world as we know it has been profoundly changed. Caesarea-by-the-sea is a highlight on nearly all of our study-tours in the Israel-Palestine. We stop at the theater, visit the promontory palace, walk the hippodrome, explore a Crusader fortress, and imagine the harbor at the center of it all. You really should consider joining us this summer. We have spaces available on three different trips. Find the dates here and email me at markziese@gmail.com for details. Sometimes I wonder how effective the big lecture hall lectures are. I try to channel my inner undergraduate as I wax eloquently on narrative construction techniques, explore the interplay between history and language, and rise to the challenge of hearing God in the text. Sometimes the feedback suggests “I get it.” Those are moments of celebration! At other times I just get stony stares. Oh well. We keep at it. The stony stares pictured above are not coming from lecture hall learners but from third-century (AD) funerary busts recovered at the site of Beth Shean (Scythopolis). This Heartland site was the leading city of the Decapolis and a real treasure trove of Late Roman life in the Lower Jordan Valley. In this case, we are learning from them. Funerary busts were erected over tombs across the Greco-Roman world, but they are rare in this part of the world. Carved in soft limestone, they display a mix of traditions, east and west, local and imported. Hair styles, jewelry, and clothing suggest a measure of personalization. Names in Semitic and in Greek languages are engraved on some and give flavor to the cultural blend that marked life in ancient Scythopolis. You can find this display at the Israel Museum in Jerusalem. If you are a museum-lover you really can’t miss the Israel Museum in Jerusalem. It contains a treasury of cultural artifacts from thousands of years of history. We’ll visit the IM several times during our 2019 travel season. If you would like to join us, there are seats available. Find the dates here that fit your schedule and shoot me email me at markziese@gmail.com. I’ll do my best to work you in. Approaching Sepphoris through the wood. East-West ridges are dominant trends in Lower Galilee. These ridges are formed of soft chalky rocks, that at one point in time, were swathed in trees and topsoil. Today, much of that topsoil has been relocated in valley floors and apart from reforestation efforts (as shown), the trees are gone. Environmental scientists tell us that the area of central Lower Galilee (as pictured here in the shaded trail between Nazareth and Sepphoris) is home to maquis forest. * Maquis is a technical term used to describe a distinctly Mediterranean biome where summers a long and dry and winters are short and wet. Indigenous trees include the carob, mastic, and a variety of evergreens, with oaks at elevation. Photo by Bible Land Explorer Susan Ruth. *See for example, Zvi Gal’s work on Lower Galilee during the Iron Age (ASOR, 1992). You are not going to find many bananas between Sepphoris and Nazareth (gotta go down into the Jordan Valley for that kind of heat), but you might find an occasional Jesus Trail hiker. For a complete list of travel opportunities in 2019, see our schedule here. You may also contact me at markziese@gmail.com for more details. Among our troop of Jesus Trail hikers this month we had a professional birder. For real! While some of us were understandably fixated on the magnificent stonework of ancient Caesarea, Susan spotted a Hooded Crow gliding by. Isn’t it amazing how multiple perspectives enrich our travel? It’s more than a slogan. Our most recent group of Bible Land Explorers just completed a walk along the Jesus Trail, a 65 km trek across Galilee. In addition to exploring sites along the Trail, we visited Caesarea, Mt Carmel, Megiddo, and Jerusalem. For a list of travel opportunities in 2019, see our schedule here. You may also contact me at markziese@gmail.com for more details. There was a break in the heavy weather yesterday. The sun broke through to illuminate waves crashing against the breakwater at Caesarea. It is hard to imagine that the artificial harbor engineered in the time of King Herod went out another quarter of a mile. Read about Herod’s magnificent Mediterranean harbor in the Jewish War of Josephus. Find a starting point here. Consider this your invitation to participate in a trip of adventure and renewal to the Lands of the Bible in 2019. For a complete list of travel opportunities, see our schedule here. You may also contact me at markziese@gmail.com for more details. We make learning fun, eat good food, sleep in some respectable places, and send you home with memories for a lifetime! The painted ceilings in the Jacir Palace, Bethlehem, are splendid. They are relics of a moment in time. The entry to the palace and its adjoining rooms was adorned with landscapes, abstract designs, and this single portrait. I believe it to be Youssef Jacir, a prominent figure of Bethlehem (died 1888). He was a leader in the local Christian church, the town’s registrar, tax-collector, and historical orator. ** He fathered five children; the eldest was responsible for building the Jacir Palace. Not surprisingly, the face of the patriarch was respectfully placed on the ceiling where he remains at watch to this day. A European artist by the name of Marco was commissioned to do the work. *An excellent source for information about such things is Sharif Sharif-Safadi’s Wall and Ceiling Paintings in Notable Palestinian Mansions in the Late Ottoman Period: 1856-1917. Riwaq, 2008. **See the history of the Jacir Palace here (accessed 12/20/2018). 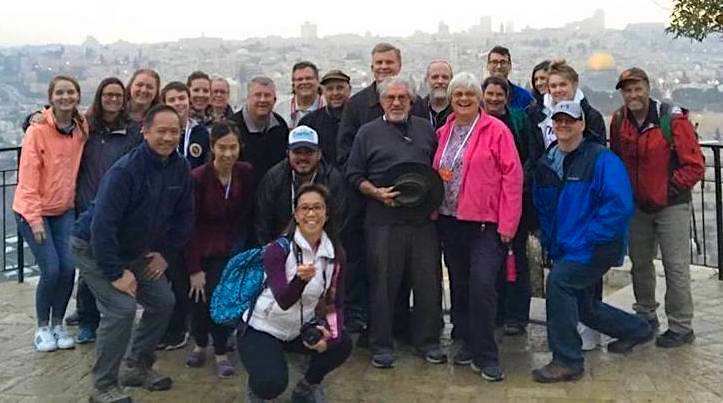 Our next group is gearing up and will be arriving in Israel/Palestine at the start of 2019. We plan to investigate the region Galilee and walk segments of the Jesus Trail. Follow this journey on our website, or better yet, consider joining us on a future trip! A list of planned group excursions may be found here. Ah Messina! Awash in the Mediterranean sun. Shaken by volcanic roots. What stories your waterfront has known! Greek colonists. Tyrants! Carthaginian galleys. Roman soldiers venture off-peninsula. Richard the Lionheart passes, grim-faced, on Crusade. Oh no! Black plague! Jesuits. Hold your ears! Boom! A German Dunkirk. Patton sneers at Montgomery. And now? After all this? Your harbor is cupped against Sicily’s breast. Boats bob. The current shifts. The moon rises. Quiet. The seas mix as we wait for swordfish. A few seats have opened up on our Johnson University Study-Tour to Israel-Palestine slated for March 12-23, 2019. If you are interested in being a part of this high-energy student trip, contact me immediately at markziese@gmail.com. Don’t hesitate. Our roster must be finalized by mid-December. Academic credit is available. The “High Aqueduct” that carries freshwater to the site of Caesarea Maritima is not a single system but two. The side that faces the parking lot is the older member of the construction; it corresponds to the birth of the city in the time of Herod the Great (late 1st c BC). A single canal carried water along the top of an elevated arcade. It is visible only in the upper right corner of this photograph. Abutting the first system is a second. This side faces the Mediterranean Sea and is largely visible here. It has been suggested that this addition was built shortly after the first. Soldiers from the Second, Sixth, and Tenth Legions assisted in repairs carried out in AD 130 according to inscriptional evidence. For more photographs and explanations of the water system at Caesarea Maritima, see the link here. For our previous post on the “High Aqueduct”, see here. Photograph by Bible Land Explorer Melinda Lee. The salty Mediterranean stretches as far as the eye can see. The view is framed by an arch of a Roman-era aqueduct. It too is all about water. This high-level conduit delivered freshwater from the shoulder of Mount Carmel to the city of Caesarea Maritima. It is a distance of ten kilometers. Constructed of kurkar (sandstone) during the reign of Herod the Great (40-4 BC), the aqueduct system stands as a legacy of engineering genius. Later phases would have to be built to account for Caesarea’s growing population. We pass a tiny sailboat entering the Strait of Messina. This waterway separates the “toe” of Italy from the island of Sicily. The constriction also marks the meeting place of the Tyrrhenian and the Ionian Seas. Alternating currents are strong enough to rip seaweed from the seafloor. Higher up, the horizon appears empty, but the space is rich with memories. Aeneas came this way following the Trojan War. The ramming warships of Carthage and Rome collided in these waters. The Apostle Paul sailed through on the way to confront an empire. Nelson grimly pursued Napoleon. The German army escaped Sicily in their own version of Dunkirk. Ah, such memories! They howl across dark water. To be moved, however, you must hoist your sails. You must read. You must imagine. You must travel. Without this effort, it is just another windy day at sea. Years ago I discovered the work of Fernand Braudel. His ten-pound history The Mediterranean and the Mediterranean World in the Age of Philip II was inspiring. Now, as we approach this famous strait I find myself whispering his ideas: the Mediterranean is not one, but many seas. Each is uniquely defined by structures, shapes, and exchanges. ﻿I’ll be meeting a group from Chantilly, Virginia for a tour of Israel-Palestine this week. Temperatures should be on the cool side as we circle the country through Galilee, the Jordan Valley, the Judean Wilderness, and Jerusalem. Know that you are always invited to participate in one of our adventures in culture and history. See the list of trips scheduled for 2019 here. il buono . . . The encircling walls of Taormina, Sicily, once protected its inhabitants. Today those walls are mostly gone, visible only in a few places. Two exceptions are found at either end of this elongated medieval city. Arched gates are preserved there. Through them runs the major artery of the community, the Corso Umberto. It is named after Umberto il Buono, “the Good,” King of Italy in the late 19th century. il cattivo . . . The Corso is crowded on this day. Taormina was once a hangout for European aristocracy, a Italian Monte Carlo. Today it is a popular stop for cruise ship operators. We jostle for position as we window shop. Creamy gelato, cold granita, and sweet cannoli call out my name. il brutto . . .
Umberto I was loved and loathed. Conservatives loved his expansionist policies. An assassin shot him on July 29, 1900. He was buried in the Pantheon in Rome. I’ll be meeting a group from Chantilly, Virginia for a tour of Israel-Palestine this week. Temperatures should be on the cool side as we circle the country through Galilee, the Jordan Valley, the Judean Wilderness, and Jerusalem. The rugged countryside of Sicily impedes travel. Contemplate this corkscrewed road approaching Taormina from Syracuse. In the Allied invasion of the island in 1943 (which involved more forces than Normandy’s D-Day), the American Seventh Army under Patton pressed Messina from the west. The British Eighth, under Montgomery, pressed to the same goal from the south. Both arms of this liberation effort, dubbed “Operation Husky,” had to contend with terrain like this. And of course, in this “great race” of WW2, the modern network of highways, bridges, and tunnels did not exist. There were just two roads that led all the way to Messina. The terrain you see here was covered by the British Eighth. In fact, the village of Taormina (at the top of this hill) would become Montgomery’s HQ. *For this quote and more on Operation Husky, see the article here. Our boots are about to hit the dirt again. We’re meeting a group from Chantilly, Virginia for a tour of Israel-Palestine this week. Temperatures should be on the cool side as we circle the country through Galilee, the Jordan Valley, the Judean Wilderness, and Jerusalem. Yesterday I posted a view to the Messina Strait from the Roman theater in Taormina (see here). From this vantage point one captures the rugged beauty of Sicily’s northern coast as well as a view to the site of old Naxos (on the distant plain). Today I offer a second view. As for the island: its original name was Trinakia (Θρινακία) or “three-cornered” (consult a map of the island and you will see why). However, it was subsequently settled and renamed by peoples from Iberia (Spain or southern France). These settlers brought with them the name of their river, Sicanus. Hence, Trinacria became Sicanai or “Sicily.” See all this from Thucydides here. Note 2: The Apostle Paul sailed by this point on his way to Rome around the year 59. See Acts 28:11-13. As for Naxos, Thucydides continues: This settlement was made by seafarers from the island of Euboea, just east of the Greek mainland. Their original home was Chalcis or Chalkida. Thucles is named as their founder. See the quote here. *Thucydides was an historian and military man from Athens, Greece. His History of the Peloponnesian War is considered by many to be the first “modern” or “critical” history to be written. The quotes above are drawn from this famous 5th century BC work. **The Late Bronze Age Fossa Grave culture. Read about this on pages 646-647 in the Oxford Handbook of the European Bronze Age (Oxford, 2013). ***See page 72 in John Fine’s The Ancient Greeks: A Critical History (Harvard, 1985). We are headed back to Tel Aviv in less than a week. I’ll be meeting a group from Chantilly, Virginia to share with them a tour of Israel-Palestine. Temperatures should be on the cool side as we circle the country through Galilee, the Jordan Valley, the Judean Wilderness, and Jerusalem. Know that you are always invited to participate in one of our Bible Lands adventures. See the list of trips scheduled for 2019 here. The theater at Taormina, Sicily was first constructed in the centuries before Christ (possibly 3rd c BC). It was reworked in the Roman period (2nd c AD) into the form we see today. The view to the landscape from the top row is spectacular, although it is unlikely that visitors to the site in its prime had the same view. The scaenae frons (back wall of the stage area) would have been as high as the top row of seats. A “lid” of canvas and ropes would have shaded the spectators. Such additions would have blocked a view to the sea but would have helped with acoustics in this pre-microphone era. In the distance you can see the Strait of Messina, a narrow band of water that separates the island of Sicily from the Italian mainland. Below, in the area of the small peninsula jutting out into the sea is the site of Naxos, the earliest of the Greek colonies on Sicily. On a clear day you can also see the volcano, Mt Etna, from here. Unfortunately, this day was not so clear. Our coach followed a team of cyclists. They seemed quite indifferent to our mass of steel grumbling behind them. Neither did they flinch at the cliff yawning on their hip, just a stray rock, a nudge, a casual flip over the rail. They pumped their fragile tubular skeletons in unison, almost birdlike, down the narrow road. I marveled at these uniformed men for a time, then returned my gaze to scenery beyond. We were headed south from Naples on the Amalfi coast (Costiera Amalfitana). A brief straightaway presented itself and driver chose his moment. He gunned it. We passed the team. It was hardly worth the effort. A few minutes later, he pulled the coach over at a viewpoint so we could get pictures. The team passed us back. They never looked up. I peeked over the edge of the cliff. It was easily 500 feet to the surf below. Could it be a thousand feet? To my left were the communities of Meta, Sant’Agnello, and Sorrento. These were splashes of color gripping the rock rising out of the Gulf of Naples. I understand why UNESCO has awarded the honor of a world heritage site to the Amalfi coast. This is the Mediterranean. This is Italy. We have several travel experiences planned for 2019 (see list here). These are organized on behalf of educational institutions or church groups. If you are a leader who is interested in crafting a unique travel opportunity for your organization or if you are an individual who would like to join a group, shoot me an email at markziese@gmail.com. Between the ancient ruins of sites like Pompeii, the deep blue of the Mediterranean Sea, and cliff-hanging towns of the mountains, the Amalfi coast has it all. The blend of natural and cultural charms is deeply satisfying for Bible Land Explorers. I now know why Caesar Augustus chose this area for his own private summer retreat. The view offered here was shot from a bluff in Sorrento. The local harbor is just below. Just around the point to the north is the Gulf of Naples and the legendary Mt Vesuvius. Italy’s Amalfi coast is famous for lemons. One cannot walk down the street in Sorrento without catching the whiff. Fragrant fruits—the size of softballs—are grown in citrus orchards and sold for juices, jams, liqueurs, soaps, dressings, garnishes, gelatos, or as treats by themselves. You can eat them right out of the skin! Pliny the Elder, a local Roman historian who died in the eruption of Vesuvius, hints at one source, calling the lemon “a Median Apple” (Natural History 12.7, see text here.). Media is an area of modern Iran. The limone femminello is the oldest variety. It has celebrity status on the Amalfi coast. And you thought the only lemon to come out of Italy was the Fiat. *"Four species” of plants are mentioned in Leviticus 23:40 and associated with the Feast of Booths (sukkot). Rabbinic Judaism connected one of these species with the etrog or citron. This is hardly an impressive photograph. I snapped it from an upper deck of the Celebrity Reflection. Rising to meet the eye is the roiling wake of this enormous cruise ship. But somewhere below the Mediterranean foam is the Hellenic Trench. It represents a lively seam in the earth’s crust. The African Plate is slamming against the Hellenic Plate. The seafloor deforms and hundreds of kilometers of seafloor have already disappeared, slipping under the Greek lip. Earthquakes are common throughout the region. The deepest part of the Hellenic Trench is the Calypso Deep. At 17,280 feet, it is also the deepest point in the Mediterranean Sea. They say the water is toasty way down there at 55 degrees Fahrenheit. Biologists recognize this as the only warm-water abyss on the planet. Looking for a Mediterranean grenadier (Coryphaenoides mediterraneusor) or a deep-diving sperm whale (Physeter macrocephalus)? This is where you find ‘em gamboling about.